What is Good Design Store? Japan Institute of Design Promotion (JDP) which manages the store, has been conducted numbers of promotion activities related to design internationally. 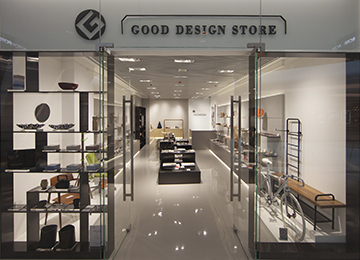 As a part, our first store named "GOOD DESIGN STORE" is opened in Hong Kong. "GOOD DESIGN STORE" is dedicated to sell the award winning products only and promote GOOD DESIGN AWARD widely. As of 2015 fall, "GOOD DESIGN STORE" has 2 stores (Hong Kong, Bangkok) and 2 point of sales (Hong Kong, Taipei). In such a vibrant and important cities in both industrial and culture of Asia, we expect a large international audience for Good Design Award and Japan Design. Around the world, there are several awards for excellent design. In Japan, there is a prize that does more than recognize good design: it celebrates design that enhances our quality of life and advances society overall. This is the Good Design Award. Launched in 1957, the good design award boasts more than 50 years of history. Since then, the Good Design Award has been given to 40,000 items around the world. Objective: Contribution to the further promotion of industrial activities, cultural improvement of the daily life and wholesome development of society through the encouragement of the design. GOOD DESIGN STORE Bangkok is located in “Central Embassy”, which is the latest hot spot in Bangkok, launched in May 2015. It is well known as the high-end flag ship shopping mall. Serindia Gallery Co., Ltd., which owns art galleries and art book stores in Bangkok, is the operator of the store collaborating with Japan Institute of Design Promotion. Copyright (c) 2014 Japan Insitute of Design Promotion All Rights Reserved.